Backsplashes make a kitchen design come together. 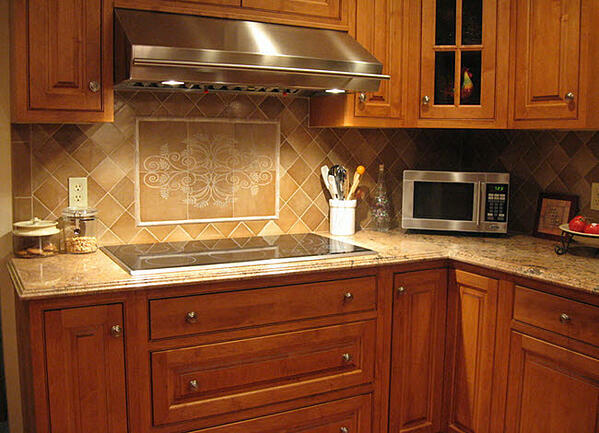 Whether square tile, subway tile, stone, mosaics, and combinations thereof, a kitchen backsplash makes a statement. It ties together cabinetry, countertops, flooring, and other kitchen details and accessories. It can stand out or blend in. And, it can make a statement with a strong focal point. In this article, we share with you 9 kitchen backsplash ideas to inspire you. These ideas come from projects Floor Decor Design Center has completed and converted into a video that you'll find at the end. As you will notice, backsplashes offer limitless design possibilities. One shape, depending on how it is installed and even what material it's made from, can create a completely different result. 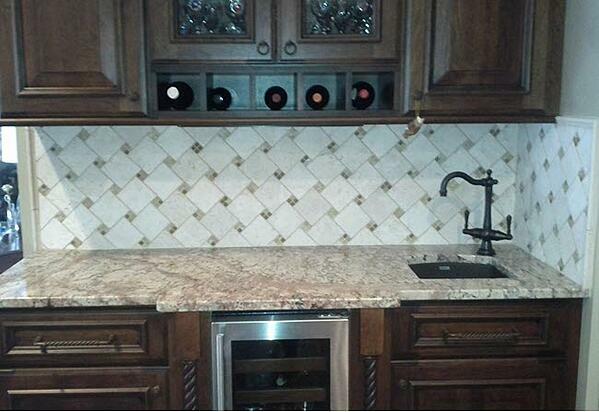 The kitchen below represents Crossville Tuscan Clay 4x4 tile in color Marrone which we installed on the diagonal. 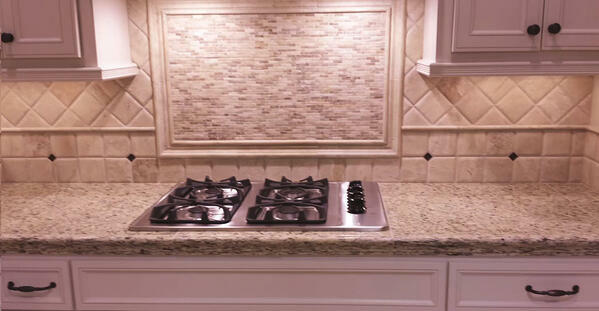 This tile has a warm sun-baked quality that works well with the existing cabinets and countertop. You'll notice that the installation features a design element over the stove. It's a beautiful curvilinear etched design bordered with white pencil liner inserts. This kitchen features a related design element over the faucet area. It consists of custom-etched decorative inserts that Stone Art created to echo the motif over the stove. 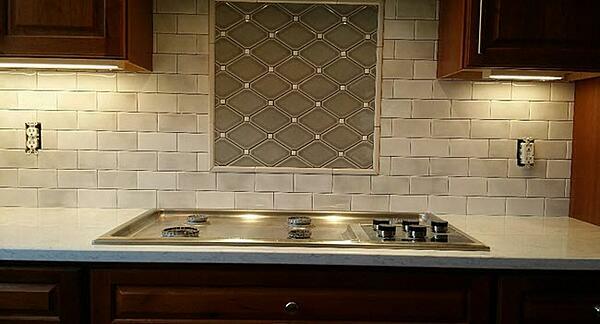 An interesting way to create contrast using the same-size backsplash tile is to install it in different patterns. 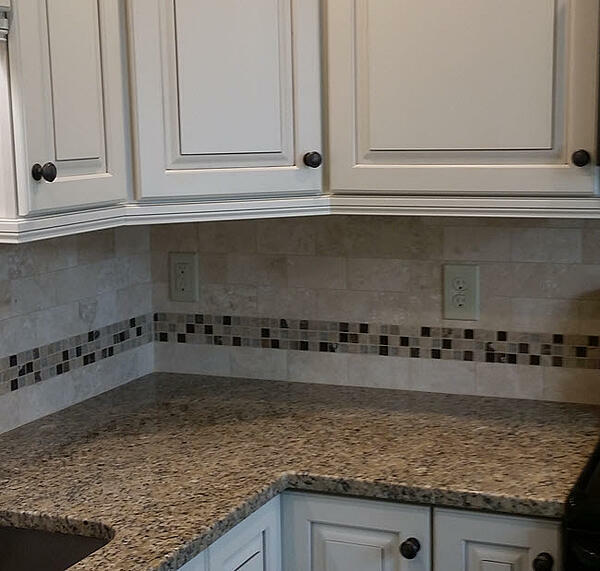 In the image below, we installed Marco Corona Origins 4x4 tile in color Alabaster on the diagonal and, on the bottom two rows, in a straight set pattern with clip corner metal dots. We separated the two patterns with a pencil liner to create more depth. Above the cooktop, we created a custom mosaic framed with a stone chair rail border. 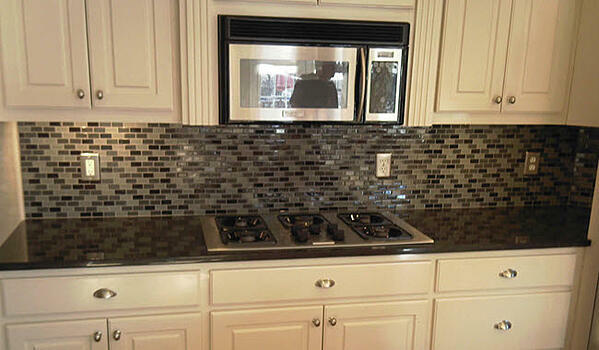 The overall backsplash blends nicely with the countertop whereas the custom mosaic ties in the existing cabinetry. We love the effect of subway tile for backsplashes. Depending on the size (2x4, 2x8, 3x6, 3x9...) and the type (marble, glass, ceramic, travertine...) of subway tile, the design possibilities are truly inspiring as you'll see from the installations below. Imagine a classic backsplash made from marble subway tile. That's what you see in the next two images where the backsplash is made from 2x4 Calacatta marble subway tile. The marble offers enough natural variation to create strong visual interest without taking away from other elements of this kitchen. We stripped and painted the existing cabinets and installed Black Galaxy countertops with Santa Sicilia Light granite for the bar area. Notice how well the Calacatta marble subway tile coordinates with the white cabinets and the black countertop. 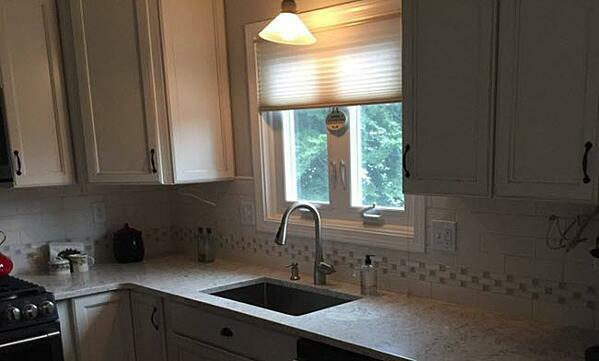 Glass subway tile adds an additional dimension to kitchen backsplashes: it reflects light. 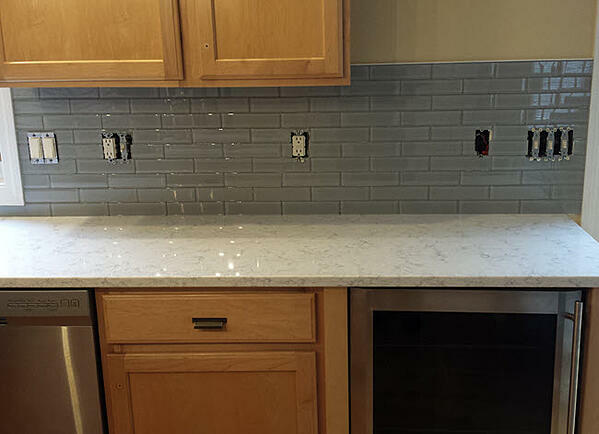 In this next kitchen renovation, we used Spirited II 2 x 8 Glass Tile in color Rain Clear in a 50% offset pattern. 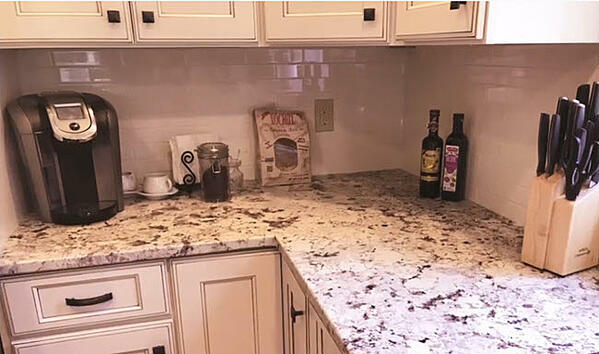 Notice how the tile color pulls in the pattern from the Viatera Quartz countertop. 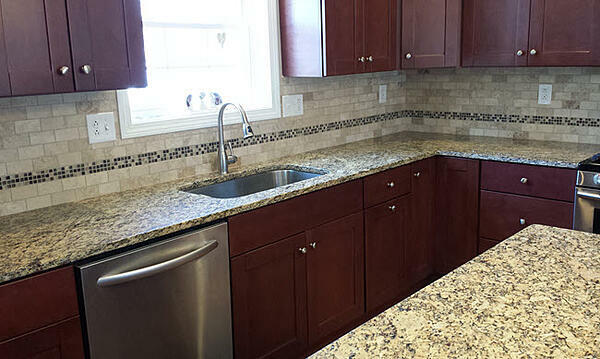 In this next image, you see the completed renovation which included refinishing the cabinets. 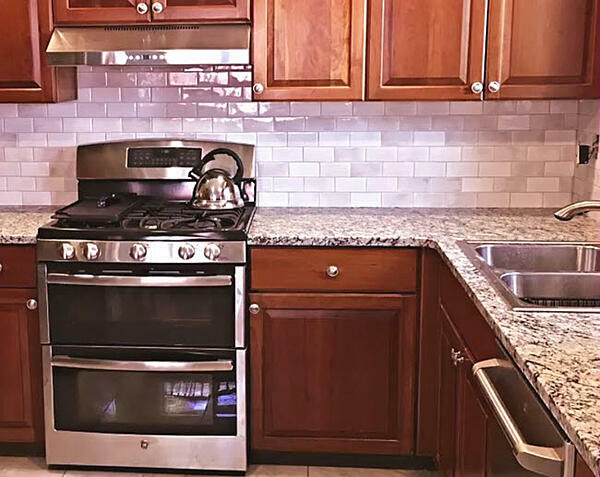 Who would think that white 3 x 6 Glass subway tile could be so perfect for a kitchen? 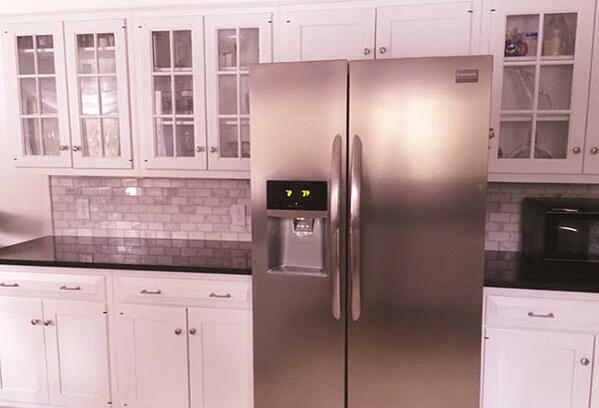 The shine adds visual interest without distracting from the cabinets or the gorgeous countertop. Here's a 2 x 4 Subway tile we installed. This particular style has variation from tile to tile which adds subtle visual interest without conflicting with the countertops. 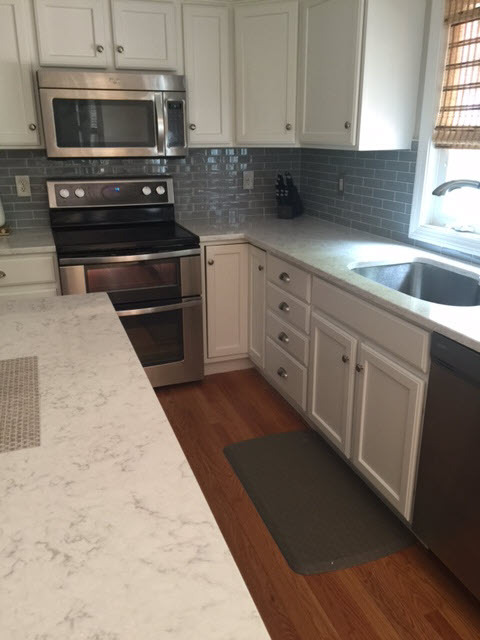 We're not done with subway tile and have several more kitchens to show you! 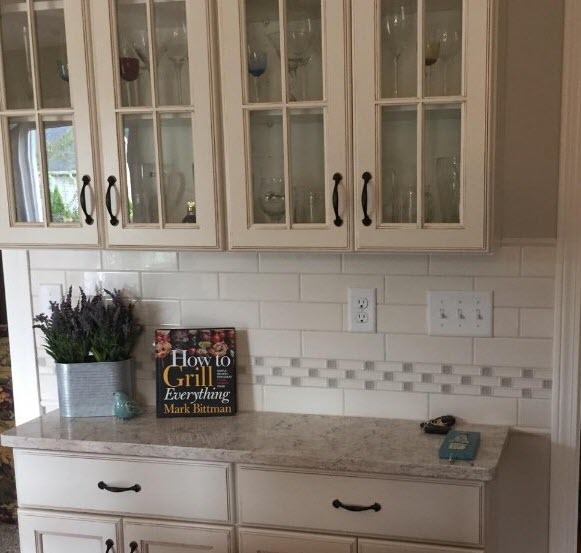 What's different here is that we've combined subway tile with other decorative elements. In these next two images, you see 2x4 Travertine subway tile combined with a decorative band of Crossville Modern Mythology tile. 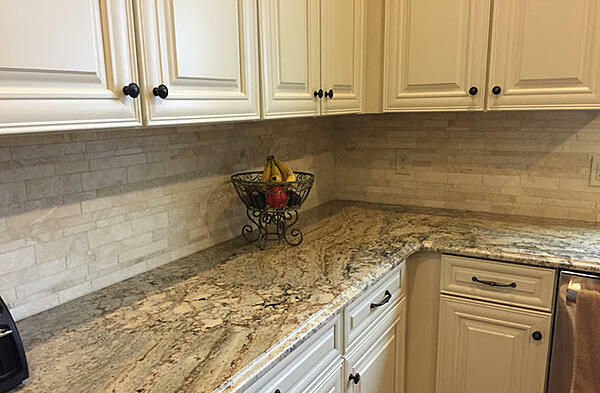 In this kitchen renovation, we replaced the countertops with Giallo Ornamental granite and the cabinets with Fabuwood Cherry Cabinets. 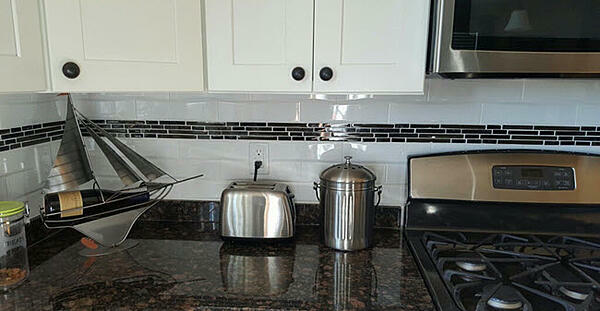 In a related interpretation, here's 3 x 6 Subway tile with 1 x 1 glass mosaic band. The decorative elements capture the variation you see in the countertop. 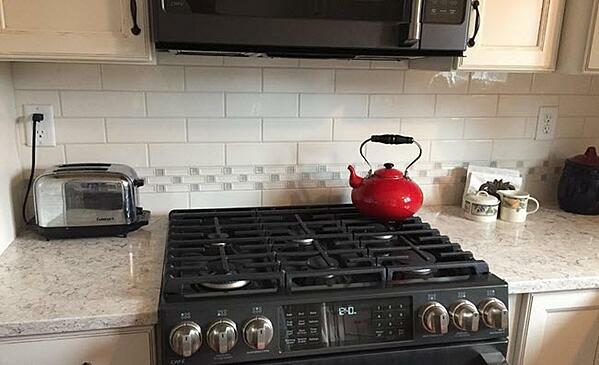 Here's a white 3x6 glass subway tile that has been combined with a decorative band of random glass mosaic strips of the same burgundy color as in the countertop. These next three images show you a kitchen remodel where the backsplash features Roxy 3 x 9 Subway tile with a brick mosaic border. The decorative brick mosaic border extends around the entire kitchen. And that includes an area separated from the stove/sink L shape. 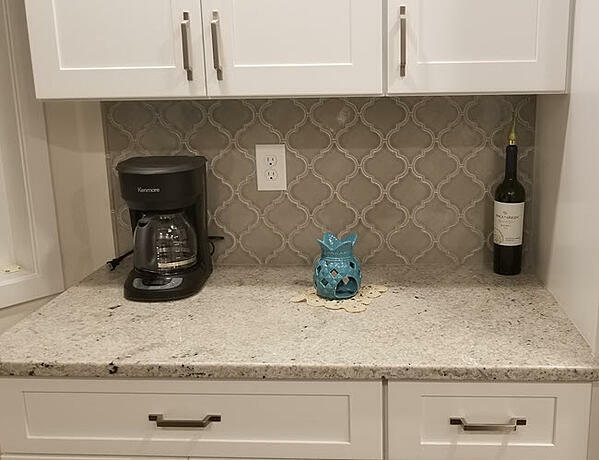 Notice how effectively that decorative border pulls in the colors from the countertop. Custom inserts over the stove area work particularly well with subway tile. This next installation uses Studio series 3 x 6 subway tile with a custom diamond tile installation bordered with pencil inserts. The diamond pattern adds geometric whimsy without overpowering the overall kitchen design. Perhaps you like the subway concept, but you'd like something less regularly shaped. 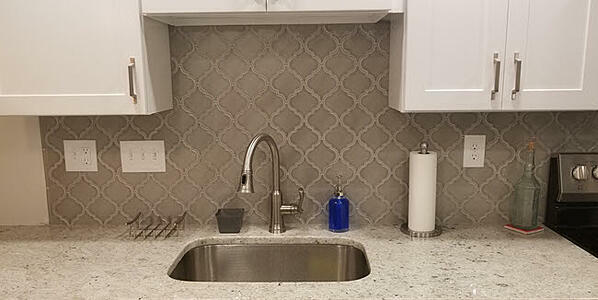 A perfect backsplash tile to experiment with is a Random Width stone mosaic as you see in the backsplash below. Don't forget to consider small glass mosaics. Yes, you can combine them with larger sized tile. You can also use them in an all over design. They are particularly effective in a kitchen where countertops are less busy. For example, in the kitchen below the 1x2 glass mosaic backsplash in several colors is an ideal counterpoint to the solid counter surface. 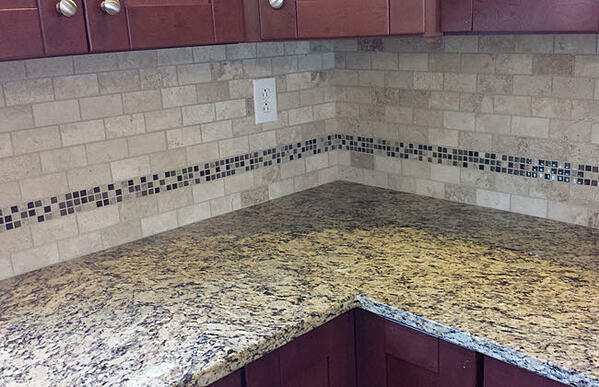 Here's an example of a traditional 4 x 4 tile that we installed on the diagonal with dot insert. This is a fun way to transform a space into a talkworthy and enjoyable nook. Here's a relatively new and whimsical tile to consider for your kitchen backsplash: an arabesque tile. In this image, you see Highland Park Arabesque in color Dove gray. It's combined with Colonial White Granite Tops and Fabuwood Cabinets. This kind of a strongly shaped decorative tile tends to look most effective in an all over design. It adds plenty of visual interest without overwhelming. 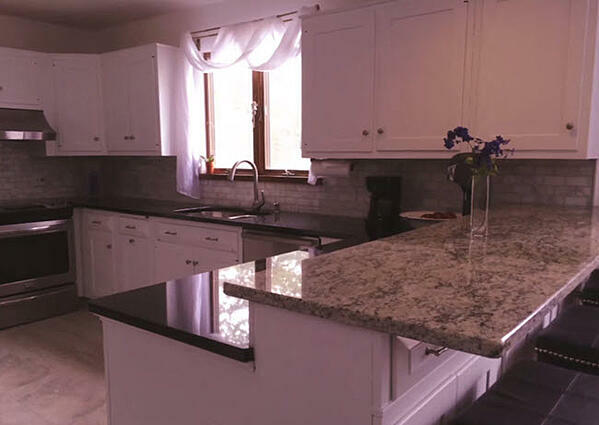 Here's the 50 second Backsplash Inspiration Gallery Video we created. Which of These Ideas Do you like most? Of these nine concepts, which do you like most? Which can you see becoming part of your next kitchen remodel? When you're ready, don't hesitate to reach out with your questions; just let me know in the comments or contact us. 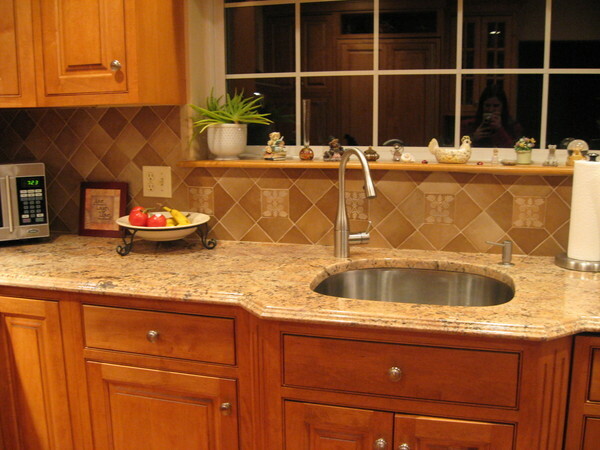 We can help you with backsplashes, countertops, as well as full kitchen remodels. When you visit one of our two showroom locations in Middletown or Orange, you'll be able to see many of these products first hand.